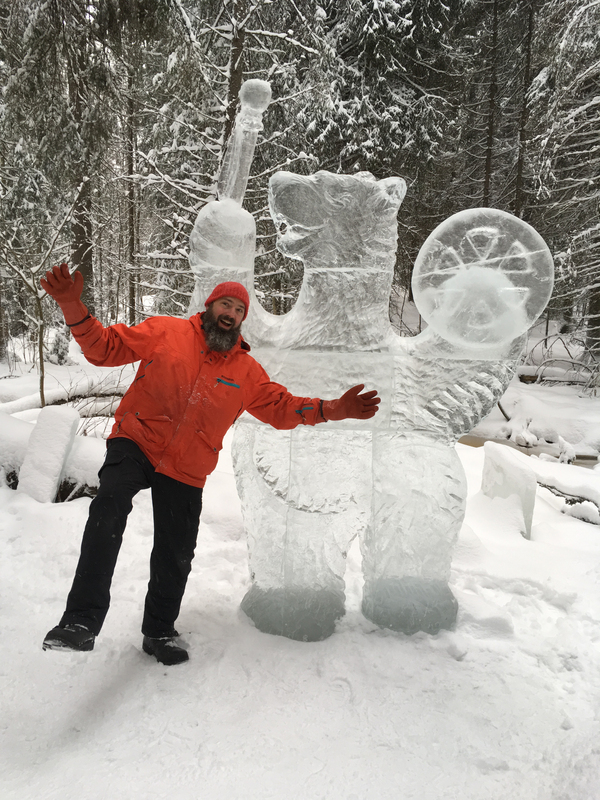 In February Roger Wing participated in three ice carving events in Finland. It was his fourth time carving in Finland and he had the opportunity to reconnect with many friends. In Tampere he stayed with Kari Manninen, known as Kaapo, whose suburban community center, Ikurin Vire, was creating a ‘spirit walk’ through an area of pristine forest. The center is a place for kids of all ages to play, soccer in the summer, hockey and cross country skiing in the winter, complete with a performance hall, locker rooms, sauna, and café. 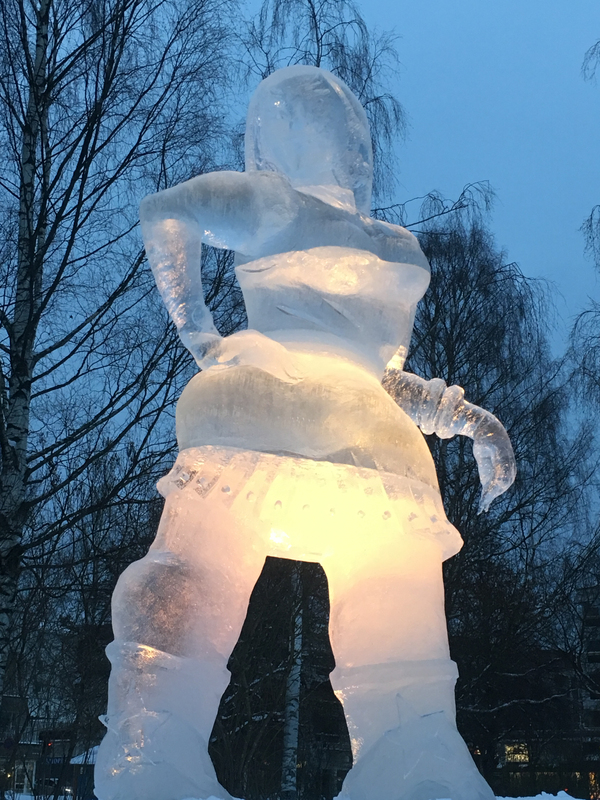 Along with Kaapo, his son, and three other Finnish carvers Wing helped to populate the trail with spirit figures in ice. There were animals, people in ritualistic animal masks, winged figures and a ‘altar’ all made of ice. Wing’s contribution was an eight foot tall ‘spirit bear’, dancing and playing a noitarumpu, the traditional shaman’s or witch’s drum from Lapland. To date over 10,000 visitors have walked the ‘spirit walk’! If temperatures stay cold a couple more weeks they expect to reach 15,000. 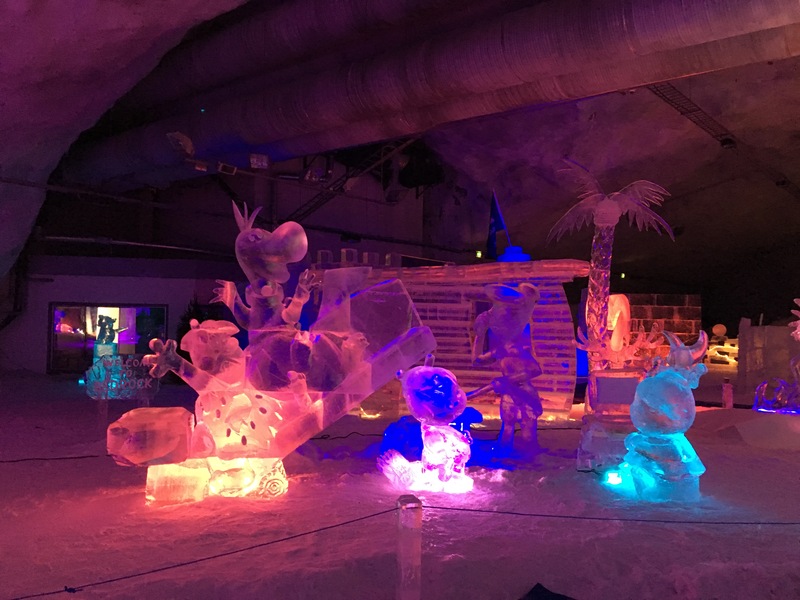 The second event, the one that brought Wing back to Finland, was themed ‘Stone Age in the Ice Cave’ and billed as the 2018 World Championship. 24 carvers from around the world gathered at the Vesileppis Hotel in Leppavirta. The hotel sits atop a man made cave, kept at -5 Celsius, that was created to provide year-round conditions for cross country skiing. 2018 was the second year that this competition was held in the cave. Some of the small carvings from the previous year still hung around. Carvers could take the hotel elevator from their rooms to the lobby and switch to an elevator straight into the ice cave. At night the hotel was a swinging hot spot with live music, karaoke, and a bar with a pool table. The conditions in the ice cave were incredible, the teams were world class and the blocks of ice from Lapland were clear and bright. The twelve two-person teams representing Finland, Mongolia, Japan, Singapore, Malaysia, Thailand, Sweden/Poland, Italy, Russia, Taiwan, China, and Wing’s USA/Holland team, carved for five and a half days. For their sculpture, Wing and teammate Martin DeZoete, imagined a scene from the Flintstones. In the scene Wilma is talking on the shell phone and cleaning with a mini mammoth vacuum cleaner. To help out, Bam Bam is lifting one end of the couch for Wilma. Pebbles is sitting, clapping and admiring Bam Bam’s strength, while on the couch Dino is losing his balance and sliding down to crush an irate Fred. The scene also included many additional elements, including a sign with the piece’s title “Welcome to Bedrock”, a wall of their stone house, a life-sized palm tree, and an ice TV with antler antennae and snow-filled screen that, with the help of a state of the art mini projector, played vintage Flintstone’s cartoons in full color. The innovative TV was a real show stopper. Wing and DeZoete’s piece took third place overall. Ahead of them were the unbelievable team from Mongolia and Team Japan. Next up was a two and a half day solo carve in Mikkeli. The town sits at the edge of Finland’s largest lake that reaches almost to the Russian border. A specialty of the region is muikku, small fresh water fish that are best served fried, crispy and piping hot. Ten carvers competed in the town’s Church Park, a lovely outdoor square with a central fountain, ringed with mature trees. Wing paid homage to one of his greatest contemporary influences, the artist R. Crumb, known for creating underground cartoons and characters such as Mr. Natural, Fritz the Cat and the Keep On Truckin’ logo. Devil Girl is Mr. Natural’s friend, a woman of impressive physical stature who simultaneously embodies what many men desire and fear, and she couldn’t care less. Although Wing’s piece was not awarded a medal, he spent the better part of two and a half days fulfilling a fantasy. In addition to these carving experiences Wing visited Norway’s Vigeland Sculpture Park on a lengthy layover in Oslo and took the ferry from Helsinki to Tallinn, the capital city of Estonia. While in Tallinn he toured the magical medieval walled city and saw highly charged, colorful paintings by Estonian artists.